Todays case is a Paediatric peril. Just for fun I thought I might run this case backwards. Start with where we end up and how we got there. You can tell me how you would have done the middle bit. So here is a shot from the monitor about 20 minutes after intubation. Not the prettiest set of numbers! Tough to say what is going on without a bit of context…. This is a 7 week old infant. No real background history of note other than a 2 day story of a diarrheal illness in the context of a community rotavirus epidemic. The pulse rate is 200, sluggish capillary refill with cool hands and feet. Looks tired, lethargic, not really responding much to the pain of IV access attempts. No fever, no obvious chest infection – a CXR is clear. ENT exam is NAD, no murmurs or skin lesions / rash. So – in summary – this is one sick chick. Profound metabolic acidosis, not perfusing the brain, skin and probably kidneys…. an IDC is placed and about 3 ml of dark urine dribbles out. So here we are. Lets talk logistics. This little one needs to go to a PICU, the closest one is about 1000 miles away by plane. there is no way that any flight team will take her without a definitive airway – the risk of mid-flight crash is just too high. IN fact as you are contemplating your next move she has a brief apnoea…. action stations. Q1: What can we do to optimise the picture prior to embarking on intubation? Q2: What drugs would you use to facilitate the ETT placement? Q3: How are you going to set up your ventilator / circuit as part of your pre-tube set up? Q4: Just to be controversial…. do you run in any bicarb? there has been a couple of cases in the coroners office in WA and SA like this..almost exactly! first off..how on earth did you get an arterial line in shocked 7week old! 3.7week old..whats your vent? anaesthetic machine or oxylog 3000? eitherway could be real vent challenge in small baby! how much does kid weigh? vent rate should match pre RSI resp rate. paeds circuit on Oxylog . PCV mode, start insp Pressure at 20, PEEP 5, FiO2 1.0 initially with aim to titrate down post tube. problem is not oxygenation but ventilation for acidosis. kids this small may not be adequately ventilated on oxylog transport vents. warning! 5. here is a pearl. if child not venting well on oxylog via ETT, replacing with LMA can work better via the oxylog. have done a 4 hr retrieval with LMA#1 and Oxylog 3000 for kid this age with bronchiolitis and worked perfectly. Sounds like concise, accurate and reasonable advice. The most disturbing part of the vitals is the end-tidal CO2 (the heart rate and blood pressure look within parameters for a patient this age). 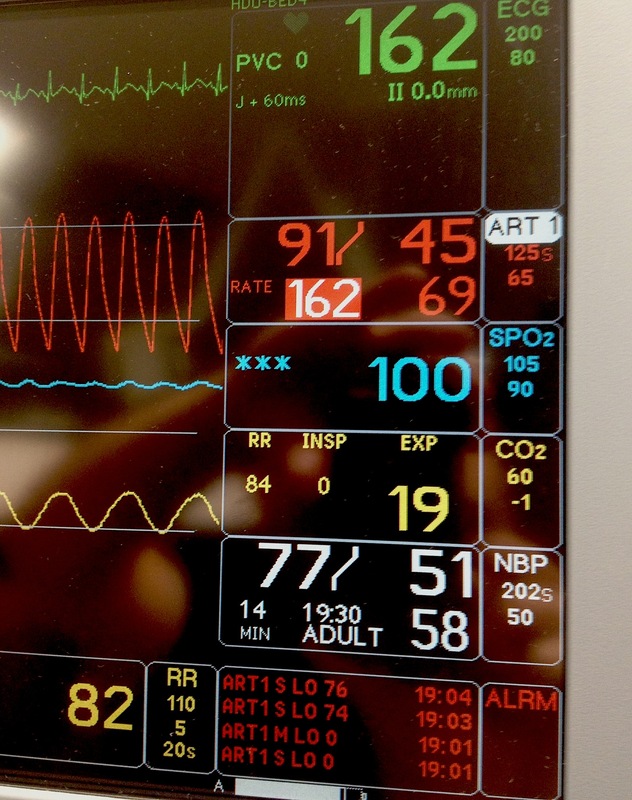 Your point about the ventilator makes me nervous–the most reasonable approach with this patient is a pressure limited time cycled device, monitored with capnography. One more thing… I would start looking for a saphenous vein in this patient (with ultrasound if necessary), as this is the low-lying fruit of intravenous access for volume resuscitation. Interesting… What’s the problem with the babylog with infants? Most of the babies I’ve intubated have been peri-partum with no drugs for induction. Do you think a case could be made for one shot at intubation with no induction or paralysis in this little one? The meds have a huge potential for badness here and most sick kids this age can be intubated without much of anything. Nothing wrong with Babylog but almost no rural hospitals in Oz have one! Its reserved for specialists paediatric retrieval teams based at PICUs. Having said that lately I know one service switched to the Hamilton T1 portable vent for seamless paediatric crit care retrievals. The early generation Oxylog 3000 had a software issue that got corrected with 1st update. It used to have this oscillatory vent pattern if the ETT was too small for it. having said that since the update it has not been an issue. Whilst the device specs say it can deliver TV 50ml minimum , in reality I have seen it not vent that well in small kids. Aren`t you guys a bit overenthusiastic about intubation? This child`s problem is most likely simple hypovolaemia and can most likely be solved with fluid resuscitation alone. Fluid resuscitation prior to induction and intubation is the key to avoiding cardiac arrest in this patient. Treatment with bicarb?–maybe a little, but aggressive treatment will have negative hemodynamic consequences. Good scenario for ketamine and rocuronium–use the formulas for weight calculation. Lacking any craniofacial abnormality, intubation of this baby should be routine, however, the most experienced staff member should be the endoscopist–there is no margin for error in patients this young and fragile. Agree with rfdsdoc’s comments. Particularly interested in LMA/Oxylog experience as would never have considered this an option. 4. I always have push dose adrenalin handy (1:100 000 adrenalin, dose = 0.1ml/kg = 1mcg/kg). Can be given via peripheral IV/IO if necessary. To be honest with ketamine and kids, I have hardly noticed hypotension even in the hypovoloemic. but of course pre intubation volume expansion is the key here! interesting last year with the FEAST trial showing harm in fluid resuscitated kids in Africa..but here in this case I would fluid resuscitate this kid! As for the LMA/Oxylog trick, it was not by planning ! cause the LMA has some leak around cuff, if oxygenation is not the issue, then it seems to work fine and is a bit safer as less risk of barotrauma. Ok smart guy. Which fluid are you going to use? Saline is the textbook answer – but what about that acidosis? Is he chloride going to kill the kid? as per the RCH guideline I cited, 0.9% saline boluses until perfusion improved ( cap refill < 3s) is current recommendation and then starting slow IV rehydration with 0.9%saline+5%Dextrose solution over 24 -36hrs. Repeated electrolytes and osmolality measures. what you want to avoid is cerebral oedema by over aggressive rehydration but you still need to volume expand for resus initially. Iwould not use Hartmanns solution as it has K in it and this kid for now has K 5.5 and anuric. you could try Scott Weingarts trick of mixing NaHCO3 ampoule wth dextrose to get the almost ideal isotonic resus fluid but to be honest I would rather go with current recommendations from Royal Childrens Hospital! the key point is you need to rehydrate the kid! The Problem with Hartmann`s is the low sodium of 131 mmol/l. Resuscitating this child with Hartmann`s will cause a dangerously fast drop of Na with the risk of cerebrale oedema. I would not be afraid of K, it will fall when pH rises. Nate, a reasonable idea. I believe Scott Weingart has done a similar thing for an adult patient with poly substance ingestion…or was it UGIB? He gave ketamine as pt agitated, inserted LMA, then got everything setup and did the RSI. I agree with rfds, first 0.9 % Nacl and then 0.9% +5% would be the safest choice for this child. Mechanical Ventilation before rehydration might kill the child due to cerebral oedema. The tendancy to correct hypocarbia before correcting hypovolemia and metabolic acidosis can lead to crebral vasodilation and cerebral oedema. ET tube would be better than a LMA in this vomiting child.